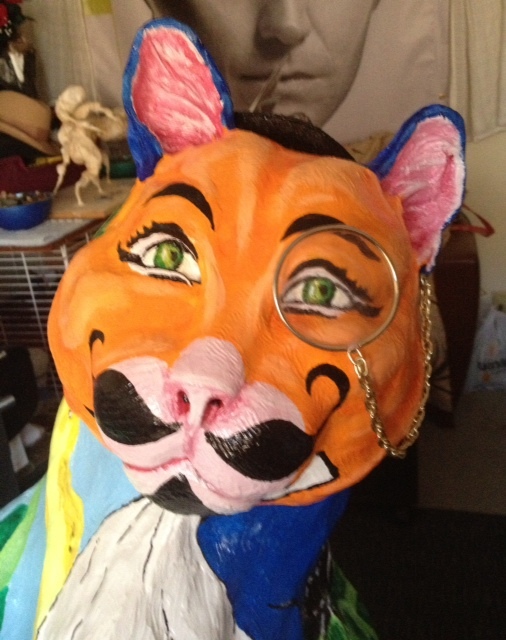 At this writing my “Clockwork Cat” is greeting visitors to Lambert St. Louis International Airport. I am thrilled at its placement and a photo shoot with a little Victorian cosplay I did with the assistance of Webster University’s Director of PR, Patrick Giblin. As in Worlds Collide, a previous blog post, the “Clockwork Cat” is a perfect blend of my two active artistic themes, animal art and Steampunk. I’m keeping this post simple, including new photos and the full Artist’s Statement. A condensed version is on the Animal Protective Association’s HarryandHanley.com site. A video and additional photos will be up on my sister page/website www.hautehen.com later this month. Please visit the sites and share #APA90, #WebsterU Thank you for your continued support! Enjoy. Looking up at the airport. The Clockwork Cat is the fanciful story of a Victorian era feline with a bit of Steampunk style as represented by his wild glowing orange color. He is a proper gent with a bowler hat, monocle, a pocket watch nattily tucked into his vest and spats adorning his feet. The bowler is his lucky hat, with all Aces tucked into its banding. Our gentleman enjoys other games as well, as demonstrated by his chess board vest. He enjoys a good cup of tea as his watch is forever stuck at 4pm, widely regarded as tea time in Great Britain. He stands in lush garden, a nod to the Victorian language of flowers, including a carpet of violets that rise up from his feet. Tender vines have captured his spyglass and the Queen Chess piece. The greenery has enchanted the smiling Knight piece to leave the chess board to explore the garden. Night and day in the garden are both represented with the sun and the moon and light and dark sides of the sky. A gust of wind blows past the sunflower, an iris, and takes our gent’s umbrella high into the sky. A literal cat o’nine tails sways in the breeze. Victorian vignettes rest on his flanks in stylish birdcages, including the “play on words” rose hips and a delightful cup of tea. There are more word plays with hearts in hands (hearts on the underside of his paws), and birds in the hands (a hummingbird on the top side of one paw and a bluebird on the other). There is a buzz in the ear with a honeybee and beetle taking residence behind our chap’s ears. Insect studies that were popular during the Victorian era are further represented by the country cricket and a monarch butterfly (which also reminds us of Queen Victoria). There are allusions to Victorian literature as well, with the Telltale Heart (Edgar Allen Poe) on his breast and a yellow snake emerging from the snowy breast as in Rikki Tikki Tavi by Rudyard Kipling. Perhaps you’d like to join the Clockwork Cat for a cup of tea and a good book in the garden? I starting calling myself a multi-media artist because being just “an artist” didn’t quite encompass all the works I create. I draw, paint, write, sculpt, dance, sing, and create jewelry. I participate in a lot of other activities that could be considered arts of their own, including yoga. Until I starting exploring Steampunk as a theme, my artistic “go to” was dogs (and other animals) in charcoal and pastel. I’ve done dozens of pet portraits, have competed in national competitions and shown my work in galleries. I’ve branched out into other visual art and illustration by will and necessity. At my first full time job, I illustrated construction equipment, which included everything from screwdrivers to the huge bridge cranes that build skyscrapers. I didn’t like it at the time, but this previous experience soon proved to be handy in drawing works for the covers of my books. They say everyone has a book in their head or wants to be a writer. That’s true for me, except I probably have at least five or six novels and a couple of trilogies just chomping at the bit to be written. I began my writing by telling fantastical stories as a child. I loved to read and became a Narnia and Star Wars fan which fueled my creative brain further. I know my yarn spinning seriously worried my mother when I started telling my best friends I was an ethereal fairy. I so convinced one of my besties that I was grounded for a week as punishment by my strict Catholic mom. I journalled my wild dreams and took advanced literature classes in high school. In college I took a couple creative writing courses. I was also playing viola and tinkered with a little fashion design. So these different media, combined with the visual art, caused a bit of heartache as I had several muses pulling me apart. Each wanted and needed attention like a small toddler going through the terrible two’s. Visual art eventually won, but every once in a while I got a story idea and would write the basics down. I worked day jobs while trying to pursue my visual art. After the housing and economy crash of 2007, I got the passion to never work a day job again. I rebooted my art business image and started writing a bit. I’d looked into journalism, but I’m really too emotional for serious reporting. Instead, there were several characters ready for birth. Then I found Steampunk. The storyline for the books came easily. Time to get it all down hasn’t. I still work a day job and create dog/pet art. But fortunately, all of my creative juices fit into the Steampunk theme. I’m creating hats and jewelry. The first book will be published in a few months. I’ve got some sketches related to the books ready to turn into full blown pieces. And I’m living vicariously through my main Steampunk character, learning and practicing what she knows/does, via whip cracking, poker, fencing, chess, and manners. Hence this blog journey of my exploits. Where these collective talents have most recently and pleasantly collided is at the “Clockwork Cat”. I was honored to be chosen as one of the artists for Animal Protection Association’s “Harry and Hanley Project”, a fundraiser for the APA through a regional public art exhibit. 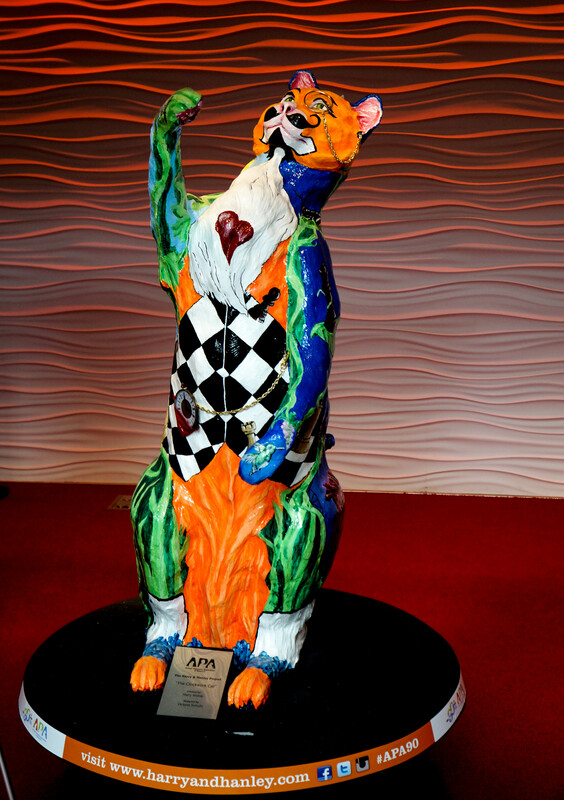 There will be 10 dog and 10 cat sculptures cast from originals of a nationally known sculptor Harry Weber. I recently finished painting my piece, the “Clockwork Cat”, done in Victoriana/Steampunk style. It will have its public summertime placement shortly. More pics and my artist’s statement will be posted on my pet art website, http://www.hautehen.com and the http://www.harryandhanley.com site in the next few weeks. If you love any of the works and want to support the APA you can text APAMO to 20222 to donate $10. 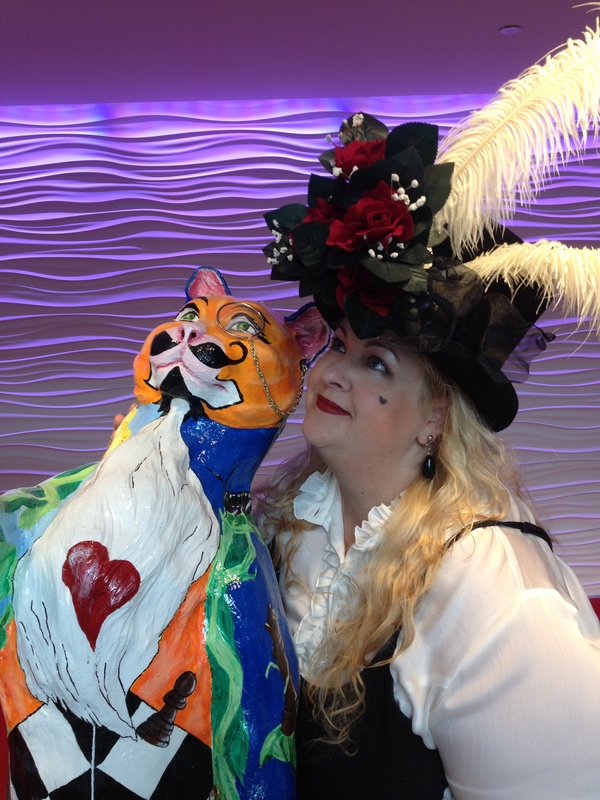 I’d love your comments, on “The Clockwork Cat” or any of my other pieces, so feel free to like me on Facebook at The Haute Hen (for the animal art) or The Countess Official Fanpage of Victoria L. Szulc (for the Steam art). And the “likes” contest is still going on at The Countess page; please like and share or follow so I can start giving away some fun Steampunk/Victoriana/Sci-fi goodies. I’m also on Twitter and Pinterest. Welcome to my collision of creative worlds.